Bilingual children as young as the age of 2 start showing greater "cognitive flexibility" than toddlers who are unilingual, suggests a new study by researchers from Concordia and York universities. The research appears to confirm what bilingualism supporters have long argued: that learning two languages -rather than "stuffing" the brains of children with too many words -actually gives them an edge over kids who speak only English or French. Earlier research showed this benefit in 5 and 7-year-olds, but the Concordia study shows it starts much earlier. "Academic performance and school readiness are based on many abilities, but one thing is for sure: this is one ability that will be helpful. 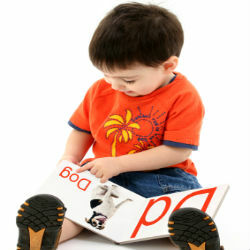 Exposing toddlers to a second language in their development provides a bilingual advantage that enhances attention control," said Diane Poulin-Dubois, Associate Professor of Psychology at Concordia University and associate director of the Centre for Research in Human Development. For more information about raising children bilingually, click here to check out our new video with Speech Language Pathologist Caroline Erdos of The Montreal Children’s Hospital.